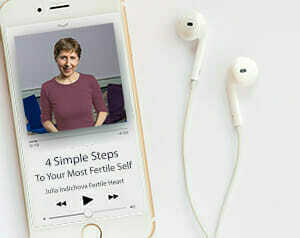 I am very new to Fertile Heart. I have read both of your books repeatedly. In fact, I continually find myself picking it up and re-reading a chapter here and there just for renewed inspiration. I will be attending my first phone circle this coming Monday and I am very much looking forward to it. Is it Monday yet? I feel like I have stumbled onto a goldmine. Prior to finding you, your books and your website, I was hearing what people had to say and giving it a shot but never really feeling anything trigger within me. Then, I came across your book and it was an instantaneous and resounding YES within . . . What you offer and share with all of us is monumentally encouraging and motivating! I have much work to do but so far I am loving the journey that began when I picked up your first book. I’m already learning how to listen to my Inner Authority. I’m making changes in my life that seem right for me. And these are changes *I* feel I should make. That seem right to me. Not changes being made because I was told it should help. If it feels right, then I’m rolling with it! That alone makes me feel so much more empowered and HAPPY! I still have a ways to go but I’m getting there and enjoying the ride. I have not yet met you, Julia. . nor have I had the pleasure of talking with you but with one brief email yet but already I am extremely thankful for you! I am that reader from Germany who was referred to you through her Harvard trained endocrinologist. I find the title of this entry apt – Rebels with a cause. Ever since I’ve started on this journey, I’ve mostly encountered skepticism and disbelief. Its tough to journey on my own, with only myself to cheer me on. The tools and the ideas remain vivid but one needs guidance and support to fuse them into one’s life. I am so grateful for your work. One easily gets steered towards the medical route of IVFs and hormonal therapy, but this is one journey that you have to map out for yourself. It makes sense – looking for the answers from within yourself. I needed many weeks to realize that the Fertile Heart way isn’t a quick fix solution. Its a journey I need to take to be ready for my not-yet-born child. And I do so gladly and humbly. Thank you again Julia from the bottom of my heart, for having taken this journey and guiding us all through it now. I heartily agree with Jane above as another Brit keen to swim against the fertility industry tide that is gathering a pace here in the UK. I love the idea of starting a list of doctors, consultants and therapists of all persuasions who truly ‘get it’, who really listen and empower you rather than choosing to scare the hell out of you. My impression is that there are enough of us here in the UK to start to have a more visible fertile heart community here and look forward to our European Phone Circles where we can explore what that will be and then make it happen. Thanks Julia for the Rebel Rousing! London Calling!!! I can’t think of a better way to say thank you than to spread the word, particularly here in the uk. The ‘Infertility’ bandwagon is gaining ever increasing momentum here with very few people or organisations respecting, promoting and utilising a woman’s own inner wisdom. Looking forward to the weekly European phone circle! Thank you Julia, for providing a road for the journey to parenthood. Quite honestly, if a clinic had told me I would have good chances of conceiving using their protocol, I’d probably have done it. That wasn’t the case, however. My system basically just shut down with the hormones and I produced empty follicles. Since then, I have been searching for the Answer, that one definitive thing I can do to create a healthy child. I am starting to suspect that that answer has always been within me. And you are providing the tools to set it free. I do wish I had heard about you years ago and I will happily help spread the word to others who so desperately need to hear your words. Thank you, thank you, thank you!! Thanks Julia, for your energy and drive, for your relentless commitment, and for your love of this planet and the people living on it, which shines out in your work. I haven’t done much work with you yet, and what I’ve done so far has been in fits and starts, but the more I read and listen, the more your truth resonates with me, and I know you can help me get to places I need to go. I hope I can do something to help you in your work too. Thank you for such an eye opening post. It is so very sad that such a personal, important issue gets wrapped up in “politics”. Where one’s desire for power subverts their common sense. Thank you for all you continue to do to help women, their children and families and their health. The gift of hope you give to women beaten down by “mainstream medicine” is truly priceless. Thank you for this posting. It helps to know what we’re up against. After being diagnosed with high FSH I was told by my doctor that there was nothing more that could be done, by them or me. At the time I felt lost, scared and believed without doctors I would never conceive. Despite this bleak outlook, I was desperate for something I could do. I turned to my acupuncturist for any book or group she could recommend. Thankfully, she told me about Inconceivable. In it, you showed me I wasn’t alone, there was hope and I was the one in control. After reading The Fertile Female and attending the Woodstock workshop I’m working with your tools. Everyday I’m learning more about myself and making my own choices to live a more fulfilling, positive, empowered life. I know I could go back and have my FSH levels checked again or start up with another clinic, but it hasn’t felt right. And while I’m still on my journey to my child I’m also traveling to a healthier mind, body and spirit. I can’t thank you enough for all the work you do! Looking forward to the Jan. 11th phone circle. Just want to add my 2 cents by saying that when my husband discovered Julia and bought Inconceivable for us to read, I had no idea the journey we were embarking on. We learned that the power lies within and that’s why usually our voices are suppressed, because to gain awareness of our own power goes against the current medical practices who are there to make money out of our vulnerabilities. I must say though that I’m grateful we have the technological advances at our hand, but we must learn to use them after we have done our inner work. I wanted to offer some of my own reflections to others who are wanting to know more about the fertileheart work and the gifts that one can receive in just a short time of working with some of the tools you offer. The Fertile Heart workshop, the phone circle, and many other practices I am connecting to and making space for in my life is bringing me to new understandings and more clarity. I love what I have heard from your work that this journey-whatever the journey should be on “our terms”. I thought many times before heading down to NY for the workshop “maybe I shouldn’t go to this”. I am SO glad I did. Julia, the entire 15 months this has been happening for me, there has been a little, soft voice saying to me that this is not about the physical, that what is happening to me is about the emotional and spiritual. That the circumstances leading up to and the state of my life is what needs attention, love and compassion in order for my body to have the energy to create new life. Yet, this voice even though I have a wonderful mother and sisters who support it, gets bullied and convinced by the medical world of statistics and science that it is a lie and no use. Your workshop was the first time I sat in a room and heard 20 people asked “is what you want possible for you?” and ever time I answered for myself “yes”. That was powerful. Thank you. Thank you for this post. It is as potent as any hormone balancing cocktail or yoga pose because it demonstrates the power of truth (as usual, you lead by example). I’m grateful that my husband and I discovered your work early in our journey toward our baby. It’s helped me to be kinder and gentler to myself, and ask my husband more openly what I need from him. I think what infertility clinics, mainstream docters don’t understand is that you are probably their biggest ally. When women work with the entire picture of who they are, what they have to give to a child, and prepare body and soul – treatments probably have a better chance of working. It’s only been about 2 weeks since I’ve started following the suggestion to listen to what my body is telling me, and I’m grateful that it will be a wise guide telling me when and what treatments could be beneficial. I’m happy that I don’t need to rush into them right away. On our first appointment with a reproductive endocrinologist, my husband and I felt completely overwhelmed and rushed. Reading your book and attending the calling circles (only 1 so far) has given us back the sense that we don’t need to rush to fit in a bunch of stuff that might or might not work. We can take it slow and discover what is right for us. The biggest fear that I have about getting pregnant is that I will get my hopes up, have a miscarraige, and be too depressed to try again. The fertile heart approach is much kinder and gentler, and I need that right now. It is starting to help me feel that my body is my friend rather than my enemy. I’m not as scared now – I know that my husband and I will be very sad if I don’t go full term with a baby, but it will not destroy us. It seems to me that if I was a doctor and heard about something women could do do increase their chances of conception, I would be happy. How does ignoring potentially life-giving information uphold the hippocratic oath? Thank you for sharing your longing for children and your generosity of love with all of us. I’m posting for the first time, although I’ve been on several phone circles. I finally found the space to write and say thank you for this wonderful work. The fact that you do it without an “industry” behind you is very powerful, and I hope to support you! In the past year, I’ve been struggling with irregular cycles, fluctuating and high FSH, and numerous experiments with food/drink, acupunture and Chinese herbs (both of which I stopped in October), and just feeling like I’m swirling in the middle of so many small inputs of information without much coherence. Attending Julia’s workshop in September, and making changes based on what my body, my orphans, my visionary, and my UM tell me has been the grounding I needed to feel better about this process of conception no matter what the oucome is. Our discussions of ancestry and traditions, of the limits of medical models, and how to make honest choices have been especially helpful. This was one of the few weeks I have been consistently practicing the imagery exercises, and I am finding that although I don’t always remember them, my dreams are quite strong and vivid, so I hope to continue this and learn more from them over time. I’m still hoping for a biological child but I’m concurrently pursuing adoption and it all feels very right at this moment. Listening (or at least trying to listen) to my UM actually makes me feel like a hugh weight is lifted off my shoulders (i.e., what I am supposed to do according to everyone else)! At this time of holidays and new year renewal, I want to say thank you again and I look forward to hearing others in the phone circles, and I too will join the rebels group as soon as I can. Meanwhile I talk about your work to many friends who are facing the same or similar circumstances! I’m looking forward to finding out how I can help you. Thank you for your courage, Julia what you’re saying definitely rings true after what I went through last year. We actually went to a meeting sponsored by an advocacy group in our area and it was basically an advertisement for the local clinic. They really pretty much talked about success rates and said how after 35 you were advanced maternal age, and showed a graph of how fertility drops sharply after 40. It depressed the hell out of me. No doubt about it that infertility is big business and everybody is competing for patients. We were actually told first by one of the clinics one fee and when we said we decided not to go through it, they lowered the cost of the IVF and unfortunately we decided to do it. I really think it messed up my cycles. My doctor said that’s not possible that the drugs are out of your body very quickly but I think my body is just beginning to bounce back. Much of it is thanks to what I’m learning in your books and in this community. I also commend you for your incredible dedication to creating this kind of community. I agree with R.D. what you’re doing is very different from anything else out there. It would be awesome to have a referral list that comes from other women and not from a listing that people can just buy into. Count me in for your Rebels team!!! !.